By Nina Frizoni on December 20, 2016 in Blog & Vlog! One of the UK’s leading massage training schools, Jing Advanced Massage Training, is coming together like never before to raise the roof for refugees. In response to the humanitarian crisis, Jing is throwing open it’s doors with a fundraising event to raise money for several small charities helping in this time of conflict – The Hummingbird Project, Solidarity and aid for Calais and Dunkirk, The Flying Seagulls Project and Brighton Voices in Exile. 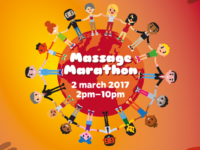 Dedicated Jing directors, Meghan Mari and Rachel Fairweather, the Jing teaching team and Jing staff are coming together by donating their hands and hearts to a massage marathon; taking place in the heart of Brighton. • And lots of money-raising! What? : Talks on the crisis, a cheeky massage in return for a donation to the cause, or even sign up as a therapist and join the team!